We have an orchard on our land that produces shrunken troll head apples. They are good for hitting with a baseball bat or throwing at a friend, nice and hard, sure to leave a mark. The trees are all oversized and gnarly and the underbrush is overrun with pine and trumpet vine which makes “strolling” through the orchard a lot like “strolling” through a jungle – bring a machete, enter at your own risk. But this year there are no troll heads – this year we have fruits. Can’t even hit them with a bat, too precious. They are admittedly a little funkier than your average Mac but no less sweet, and the fact that they are just going bonkers out there on their own, I’m sold, lets plant about 1,000 apple trees. I’ll even wear a pot on my head, invoking the master. The classic Maine homestead wouldn’t be complete without a small orchard. Our ancestors grew apples of all shape and size for a variety of things – pies, fresh eating, sauces, vinegar, cider. When you tromp around in the woods you often find old apple trees growing little nasties. There is a chance that those apples were never meant to be eaten out of hand – that they were specifically planted for their qualities in cider or some other awesome thing. They could also be wayward windblown volunteers teeming with confused fruit. Hope you are feeling up to making a pie this week as we have packed some of our ancient Wells apples into the share. Marina made a batch of apple sauce with these bad boys as well, fantastic. 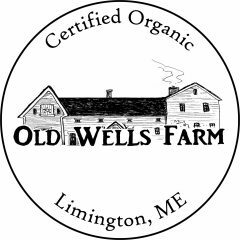 We are also packing a healthy head of lettuce, some pac choi, parsley, onions, garlic, a quart of tomatillos and a quart of tomatoes, sweet peppers, a couple of hot peppers and a fine buttercup squash from our friends at Broadturn Farm (organic). We hope you are having as good of a season as our old orchard, in your heart and in your head, in your life, whatever you were grown for, whatever field you are standing in.